All of a sudden the WS chrome plugin decided to stop connectiong. yet when I start debug, WS at the bottom of the debug pane stagnates saying "Waiting for connection from JetBrains IDE Support extension for Chrome. I've reinstalled the WS plugin but no luck. I don't get how this can all of a sudden just stop working. yet when I load that page which loads ok, the WS Plugin shows greyed out still in Chrome. 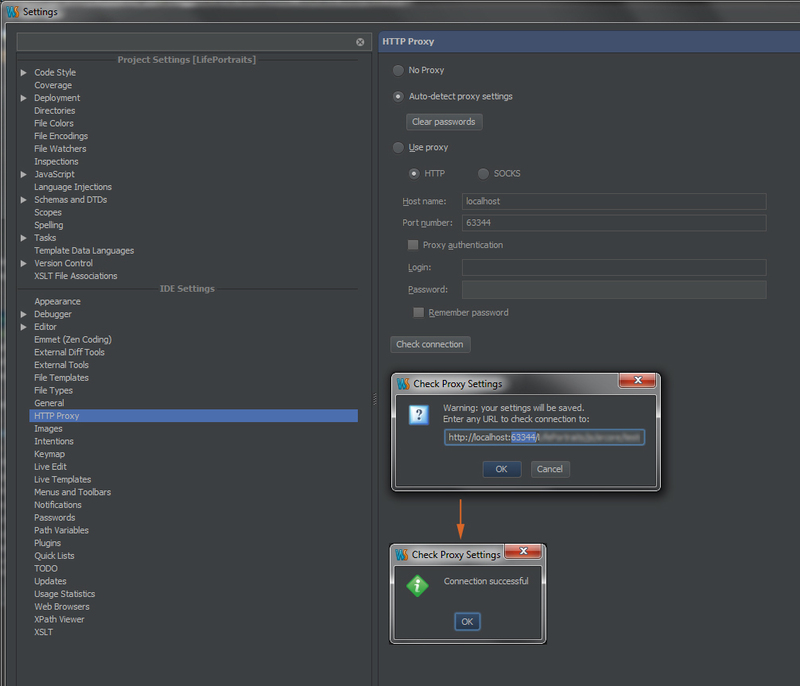 The port and host match in the WS plugin. Also in the past when I had started debug, WS would launch a new tab in Chrome and run that url. Now when I start debug, it opens a NEW chrome instance instead of just adding a new tab in my existing Chrome instance and when it opens a NEW window/instance it doesn't bring up any url, it just starts up Chrome with blank in the address. No idea why WS decided to go awal on me and I've tried all I can think of here. Reingstalled WS itself, reinstalled the Plugin, cleared Chrome cache, cleared WS's cache, yada yada. Noticed if I debug with FireFox, the WS plugin works fine and I can connect and Debug and step through code in WS. 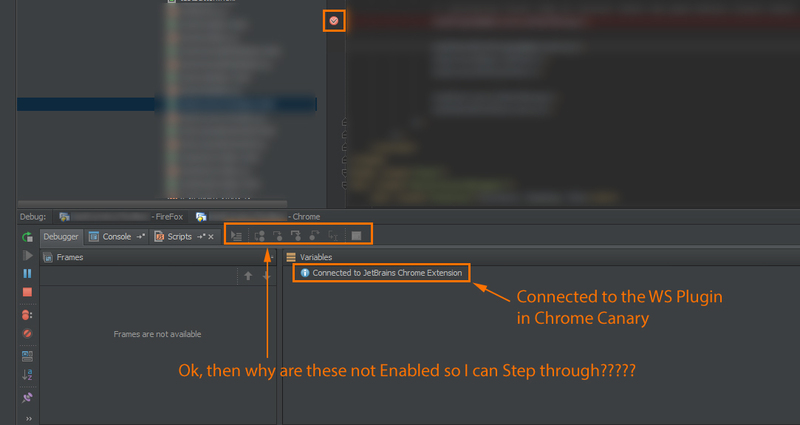 please, can you attach the extension console contents (see http://confluence.jetbrains.com/display/WI/LiveEdit, How do I know what's wrong?) and the idea.log? have never seen that section before, that's cool. ok so it says I don't have LiveEdit installed. Is that a requirement? How come your docs mention nothing about it in Debug instructions? And I had this thing debugging without having LiveEdit installed anyway for 2 months. but I'll install LiveEdit now regardless. Still don't know what's causing WS debug breakpoints not to be hit and the WS plugin to fail. While looking at the error above, it's talking about http://127.0.0.1:63343/browserConnection/buildInfo. When I go there my web server is not finding that page. However I've been running my page that I want to test under http://localhost:63343/.... but that shouldn't matter I don't think. In fact I've tried changing up the proxy to use 127.0.0.1 vs. "localhost" and it didn't make a diff. Why it can't find this browserConnection/buildInfo where the 63343 port is the WS port I don't know. Not even sure if this is my problem anyway. 2013-05-30 10:34:27,212 [ 2848] INFO - api.vfs.impl.local.FileWatcher - Native file watcher is operational. 2013-05-30 10:34:28,236 [ 3872] INFO - om.intellij.util.ProfilingUtil - Profiling agent is not enabled. Add -agentlib:yjpagent to idea.vmoptions if necessary to profile IDEA. 2013-05-30 13:45:37,883  INFO - .history.utils.LocalHistoryLog - Local history storage successfully closed. 2013-05-30 13:45:37,910  WARN - api.vfs.impl.local.FileWatcher - Watcher terminated. 2013-05-30 13:45:53,472 [ 5283] INFO - #com.intellij.idea.Main - Using "FocusKiller" library to prevent focus stealing. 2013-05-30 13:45:56,255 [ 8066] INFO - api.vfs.impl.local.FileWatcher - Native file watcher is operational. 2013-05-30 13:45:57,590 [ 9401] INFO - om.intellij.util.ProfilingUtil - Profiling agent is not enabled. Add -agentlib:yjpagent to idea.vmoptions if necessary to profile IDEA. 2013-05-30 13:48:13,725 [ 145536] INFO - .history.utils.LocalHistoryLog - Local history storage successfully closed. 2013-05-30 13:48:13,729 [ 145540] WARN - api.vfs.impl.local.FileWatcher - Watcher terminated. 2013-05-30 13:48:20,515 [ 499] INFO - #com.intellij.idea.Main - Using "FocusKiller" library to prevent focus stealing. 2013-05-30 13:48:21,498 [ 1482] INFO - api.vfs.impl.local.FileWatcher - Native file watcher is operational. 2013-05-30 13:48:22,411 [ 2395] INFO - om.intellij.util.ProfilingUtil - Profiling agent is not enabled. Add -agentlib:yjpagent to idea.vmoptions if necessary to profile IDEA. hmm, works in Canary as far as the plugin enabled and connected again, don't know why though. But my debug points are still not being hit. Outside of Canary, in regular chrome, I still can't even get the WS plugin to reconnect which leads me back to the original issue. As a side effect of  Issue 176962  being fixed there is now a command line switch (--silent-debugger-extension-api) and a flag in chrome://flags ("Enable Silent Debugging") that prevents the warning from showing. This is live in the current canary build (since r184645). I hope it should contribute to making web developer's life better. however, I do not want to be using Canary to be testing my code for obvious reasons, it's not stable as it's the experimental side of Chrome...not the deployed Chrome that we all use. This is so freakin bizaare. Ok, I went and changed my site in IIS 7 not to use the port 63343 for my site that I am testing and went back to using 80. Ok all fine and dandy, but still, it's not hitting my breakpoints and yes that code is being called and should be hitting the breakpoints. So while I went back to using port 80 in IIS for localhost and keeping the port at 63343 for the WS plugin and then auto detect proxy, while that gets me close, it's still not enabling the debugging step through options and hitting my breakpoints. Now the plugin is enabled again, and when I debug from WS, it launches a new tab in my existing Chrome browser which is what it's supposed to do. Prior to this, when I had the site set to 63343 port across the board, for some reason WS would launch a whole new browser window completely seperate from my running Chrome instance. WHY?????? This is really frustrating, weird, and I can't figure out what the heck WS is doing and why there is so much variation on what happens in terms of it even launching Chrome when you change ports across the board like this.